Britax Blink Stroller Review & Giveaway! We recently had the opportunity to review the Britax Advocate CS Car Seat and we were even lucky enough to have the opportunity share the same car seat with one lucky “Deal”ectible Mommies reader! We love this car seat so much that we are back with a review & giveaway of another Britax product: the Britax Blink Stroller! Your all familiar with my love for strollers and as a self proclaimed stroller enthusiast, I have to say the Blink has a lot to offer for a small price! Solid, solid, solid! Britax is well known for their safe and solid car seats and when the stroller arrived, it was apparent that they built their stroller with the same philosophy in mind. Often times, umbrella strollers are flimsy and can be pushed over with a simple flick of a hand. This is not the case with the blink! This stroller is well made with solid construction and you’d have to put some serious effort into pushing this stroller over. The fabric immediately caught my attention with it’s bold blue background color and bright modern circles. A neutral choice that would suit boys or girls and please both mom and dad! Out of the box, the stroller is nearly assembled, I just had to pop on two wheels and the canopy and we were off. Releasing the stroller from the folded position can be done very quickly with just the flick of a plastic clip on the side of the stroller and a push of the foot in order to lock it in place. Lil’ Pea couldn’t wait to sit in her new ride and was buckled in the 5-point harness before I could blink! Pushing the stroller is simply amazing. This is the first umbrella stroller that I have pushed that required zero effort to not only push but to turn and steer. A truly smooth ride for baby. I attribute this to the solid construction of the stroller and the all wheel suspension. The more I pushed, the more I became fond of our new ride. Of course daddy had to jump in and give it a push and he instantly fell in love because he didn’t kick the back of the stroller. This is the first umbrella stroller that we have owned that he has not kicked while pushing. So those of you with a long stride…rest assured! The Blink even sports a very large storage basket where mom and dad can toss blankets, toys, diaper bags and my favorite…shopping bags! The rear brakes can be engaged with a simple push of one foot and engages both rear wheels at the same time. The brakes feel beefy and solid and once the brake is engaged, this baby isn’t going anywhere! When it was time to close up shop, I simply pressed up on the foot piece in the back of the stroller with my foot and it released the locking mechanism. I then pressed down on the side lever with the bottom of my foot while at the same time, pulling up on the carry strap. The stroller immediately collapsed into the folded position and automatically locked into place. The process can be easily completed with one hand and proved to be quick and simple. Check out a full product demo here. The Britax Blink features an over sized canopy and is the largest canopy I have seen on an umbrella stroller to date. This protects little one from the suns harmful rays and offers baby an overall more comfortable ride. There’s nothing worse than the sun beating directly in their little faces! A Peek-a-boo window is located on the canopy, a feature rarely seen on umbrella strollers. The fabric folds back and is held in place by a toggle clasp. It’s as if baby has their own little curtain….ok all together now…awwwwe! When peek-a-boo time is over, the fabric can be placed back over the window and holds its position with velcro tabs. The back drop of the canopy also features a zippered pocket where you can toss your keys, pacifiers, cell phone or just about anything else you can think of. The Britax Blink offers a pretty deep recline, although not completely flat. A great feature for us is that the fabric hugs tightly around the back of the stroller and when in the full recline position, it creates a cozy, enclosed space where baby can sleep and rest comfortably and quietly. This is a favorite feature as Lil’ Pea has a tendency to fall asleep while were out and about and I feel comfortable knowing that she is comfortable! The leg rest can also be extended, giving baby more room to stretch out. Lil’ Pea is not so small anymore and she can sleep comfortably stretched out in the blink. The Blink also comes equipped with a carry/travel bag and this is certainly one accessory that you would typically purchase separately. The carry bag is perfect for throwing over your shoulder for travel and also doubles as a nice storage bag when the stroller is not in use. The Britax Blink offers a large number of features packed into one small umbrella stroller and at a low price point! With its solid construction, ease of use, travel friendly carry bag and multitude of features, we give the Britax Blink 2 thumbs up! This is one umbrella stroller that I would purchase again and I one that I would recommend to friends and family! The Britax Blink is recommended for children 6 months to 55 lbs and the best part is that you get an awesome umbrella stroller loaded with features for just $100! 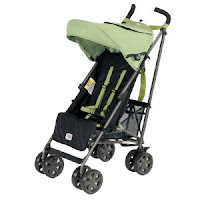 YES..the Britax Blink has a new price and it won’t break the bank! Oh Britax..how I love thee! Visit Amazon or find a retailer near you! 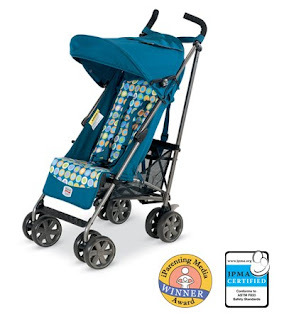 One lucky “Deal”ectible Mommies reader will WIN a Britax Blink Stroller!!!!! Simply visit Britax and tell me one other product you love! You may find it hard to choose just one, so feel free to tell me more! Extra Entries: The initial entry MUST be completed before any extra entries will count!! Each comment counts as 1 entry..so if you qualify for two entries, please leave two comments!!! 2. Fan “Deal”ectible Mommies on Facebook! 4. Follow “Deal”ectible Mommies…You can Follow My Blog on my right-hand sidebar! The boring stuff: Open to U.S. residents only. Giveaway will end on April 30th at Midnight! Winner will be chosen using random.org! Giveaway Disclaimer: Our sponsors are responsible for prize fulfillment. Please allow up to 6 weeks for delivery, although we hope it’s right away! Disclosure: Britax provided me with the Blink stroller to facilitate my review and one for giveaway purposes. My thoughts and opinions remain my own! I love all their car seats! Yea! I'm a Fan "Deal"ectible Mommies on Facebook! We have the Roundabout and love it! Thanks for the chance. I would love the Marathon High Capacity car seat in the cow pattern! I would love to get an cow-print Marathon seat!! I am a google friend!! I love the Britax Marathon car seat. Loving the Advocate CS car seat for my daughter! I also love the Chaperone stroller! I also love the marathon car seat! I love the Britax Car seats, esecially the Chaperone and the Marathon. I like the Chaperone because it is for 4 to 35Lbs. I like the Marathon because it is for up to 65lbs. Britax makes the best and safest car seats. I Subscribe to "Deal"ectible Mommies by Email. I Subscribe to "Deal"ectible by feed (Google Reader). I Follow "Deal"ectible Mommies via the gismo on the right-hand sidebar! I still like the trusty Britax Marathon in Camooflage That cow print is funny! Love the Britax Marathon in Allie, thanks! I love the Chaperone car seat. #1 Grabbed your Britax giveaway button for my right sidebar. #2 Grabbed your Britax giveaway button for my right sidebar. #3 Grabbed your Britax giveaway button for my right sidebar. I love the chaperone infant car seat. I love the Advocate Car seat! I'm a fan of yours on facebook! I love all their car seats!!! I have the roundabout but I would love the advocate! follow you. Did I already say that? I would want to get the Advocate car seat. I'd also like to have the Boulevard CS Car seat. Thanks for the chance to win. I like the Anti-Rebound Bar for Britax rear facing car seats. This and the side impact feature makes the Chaperone Infant Carrier car seat a safe choice. I have the stroller button on my sidebar. I'm a fan of Britax on Facebook. I also would love to have their Chaperone infant car seat. I love all of their Convertible carseats. I especially like the Boulevard CS b/c of how it reclines. The Frontier 85 looks awesome! I also like the Roundabout car seat. I also love the Marathon! I fan Britax on Facebook. I love the Chaperone car seat. But your right they have some wonderful products. Thanks for the entry. I am also a Email subscriber. I like the Diplomat car seat, looks comfy! I like the Advocate CS High Capacity convertible carseat. Thanks for the giveaway! I have the Roundabout car seat and LOVE it! Became a fan of "Deal"ectible Mommies on FB. Am already a fan of Britax on FB. Grabbed the button for "Deal"ectible Mommies for my blog! I have been eyeing the Britax Marathon car seat, it seems like such a good product. I like the boulevard car seat. I love Britax. Both my children have their seats- We have a Roundabout and a Marathon… cant sing their praises enough! The Chaperone stroller looks really great too, and I love the canopy netting accessory – great for summer! I love the Britax Chaperone Infant Car seat. Thank you for sharing this cool giveaway with us. I like the chaperone car seat. I like the Frontier 85 car seat. I love the ADVOCATE CS car seat too. I like the Chaperone infant car seat. I love the marathon, though I'd really like to try out the advocate cs! I also like the Parkway SG booster seat. Thanks! I follow you on twitter, and I tweeted! The Advocate CS carseat in Kathryn looks great! I love the Britax Advocate CS car seat, so gorgeous. I subscribe via email. Thanks for the opportunity! I tweeted about the give away. Thanks! I am a fan of Britax on Facebook. Love the chaperone infant carrier. I love the marathon car seat as well! I like the car seats you have. Please enter me in this giveaway. I'm LOVING the Chaperone car seat – their products look amazing!! I follow on twitter as @champagnewisdom and tweeted – yay!! also love britax marathon carseats! I like the Marathon convertible car seat. Oh I love the Chaperone Infant seat! I visited Britax and I really like the High Capacity Convertibles Advocate CS carseat for my granddaughter who is 3 months old. I am following you on twitter and tweeted giveaway. I fanned you on Facebook. I subscribed to your blog by email. I am publicly following your blog via google connect. I grabbed your Britax Stroller button. I grabbed your button and added it to my blog. (right sidebar, scroll down). I fanned Britax on Facebook. I am following Britax on Twitter. I love the advocate carseat! I'm a facebook fan!!! finally It took me forever!!! ay caray! I love our cow-print Roundabout! The roundabout 50 looks pretty comfortable and easy to use. Funny I actually love the Advocate CS! I would love to try it out… I currently have the Boulevard and really like it! fan of "Deal"ectible mommies on facebook! I subscribe via rss feed! fan of Britax on facebook! The Britax Marathon car seat in the cow print is definitely something else I love from their site! I would LOVE to have the Chaperone infant carseat in either redmill or savanah for our baby on the way! The Britax Marathon, then for accessories : foot muff & armrest covers. Fan of "Deal"ectible Mommies on FB! Already subscribber of "Deal"ectible Mommies by email. I follow "Deal"ectible Mommies blog. I either need a stroller or a high compact, convertable car seat for my 2nd child due in July. I still think the Britax Advocate is pretty cool. I follow you through RSS feed! I love the Britax Chaperone stroller and carseat! Fan of “Deal”ectible Mommies on Facebook! I love the Britax Marathon car seat! I’ve been wanting to get one of their car seats for a while now. Have heard great things! Looks like this stroller is a win too. I love the Diplomat carseat….and the safety standards are wonderful! Follow on Twitter and TWEETED! .-= Mary Williams´s last blog ..I’ve Got to Share This Great Camera Giveaway!! =-. I love the marathon car seat! The cow print is too cute! I like the rain cover! What a great idea, probably keeps the stroller warmer in the fall too. I love the designs that they have for the car seats and strollers. Became a fan on Facebook! I really really want the Blink stroller for my grandbebes! It would make it SO much easier for me to tote them around! The other product I would love is the Boulevard CS car seat! .-= Julie Smith´s last blog ..On Single Parenthood and Single Fathers … Random Thought =-. .-= Ida Mae´s last blog ..Handmade Happiness =-. I like the Boulevard Car Seat. We have a Britax car seat and LOVE it. I’d like another for my other son. I like the chaperone stroller. .-= Mary Williams´s last blog ..Friday Favorites!!! =-. I am a Britax fan on Facebook! Would love love love to have the Britax Marathon car seat…as soon a my little guy grows out of his infant seat that is on our list of must buys. I became a fan on facebook! We have three Britax Marathons and two Roundabouts, and we love them! I’m a Britax Facebook fan! I love the Marathon carseats. They’re the best! I’m a fan of Britax on Facebook. .-= Ida Mae´s last blog ..A Day of Family =-. .-= Tammy @ LoveMy2Dogs´s last blog ..Post It Note Tuesday! =-. Subscribed to your blog by email, fanned you on facebook, and fanned britax on facebook. I have the chaperone infant seat and stroller. I LOVE THEM! The stroller is so simple to use and is VERY smooth to use. I love that I steer with one hand very easily. I love the Boulevard CS car seat! .-= Lauren @ Hobo Mama´s last blog ..Wordless Wednesday: General adorableness =-. I am your Facebook fan (Lauren Wayne). I subscribe to your RSS feed in a reader. I am a Britax Facebook fan (Lauren Wayne). I follow Britax on Twitter (@Hobo_Mama). I love the Marathon Carseat!! I LOVE the the Britax Chaperone carseat and stroller (though an odd name for it). Put your button and link on my facebook. .-= Ida Mae´s last blog ..Just an Update.. =-. I’ve always been a fan of their carseats, especially the roundabout. I saw that on their website! .-= Tiffany´s last blog ..All Natural Melba Snacks =-. I really like the Advocate CS car and the Marathon car seats! .-= Stefanie´s last blog ..Marshall’s Gift Card Giveaway WINNER!!! =-. I love LOVE the Britax Roundabout! Best car seat I’ve ever had and I review a lot of car seats. I have your button on my blogroll page. .-= Lee´s last blog ..I Am On The Look Out For Sponsorship For Type A Mom Conference! =-. .-= Silvia´s last blog ..Día del Niño / Children’s Day =-. I love the Roundabout seat. I own it, and it seems comfortable for my daughter. .-= Andrea B´s last blog ..North States Superyard XT =-. The Britax Marathon car seat would be awesome to have! Oh what a neat stroller. My sons are outgrowing the cheap umbrella stroller we have and this nifty one would realy come in handy. I also love the Chaperone stroller. I love that they both go up to 55 lbs unless most strollers. VERY hand when you have a special needs child that has trouble walking long distances. I tried to subscribe via RSS but said I couldn’t due to link not found? If you let me know the right one, I will! .-= christy´s last blog ..DYMO Label Printer Giveaway =-. Your request has been accepted! I would love to have the Britax Boulevard CS carseat! Did we find out the winner? I LOVE their car seats!!!!!!!! .-= Suzanne´s last blog ..Ribbon TuTu and Hair Accessory WINNER!!! =-. The full size “Chaperone” stroller! The Print is SOOOO cute! I “Like” you on Facebook…. I just purchased this stroller on Diapers.com for $84.99! They have it on sale for $99.99 then I used their site’s coupon code SCGEAR and received an additional 15% off making the cost of this stroller $84.99!